This step by step diy project is about how to build a garage roof. Building a roof for a single car garage is easy, but there are a few thing you should take into account, such as the shape and structure of the rafters. Build the components from weather-resistant lumber, if you want to build a durable roof for your garage. A front and a back overhang will add style to your construction. First of all, you should remember that in most of the cases you need a building permit, when making a garage. Therefore, we recommend you to plan every aspect form the very beginning and to make sure the plans comply with the local building codes. Work with attention and with great care, if you want to build a rigid structure that will support the weight properly. We strongly recommend you to use tongue and groove plywood sheets, if you want to get tight connections. Secure the sheets to the rafters with nails / screws every 6-8″. In addition, if you want to enhance the look of the shed by fitting trims, we recommend you to leave an overhang of about 3/4″ over the end rafters. Use a good miter saw to cut the ends of the trims before attaching them into place with finishing nails. Don’t forget to check the rest of our garage building projects. Smart Tip: Building the roof for a single car detached garage is not as complicated as it might seem, but there are a few things you should take into account, especially if you want to get a rigid structure. Follow the instructions and use quality materials, if you want to get a professional result. The first step of the project is to install the bottom rafters to the frame of the garage. As you can see in the image, you need to cut them at the right size and secure them to the top plates with galvanized screws, after drilling pilot holes. 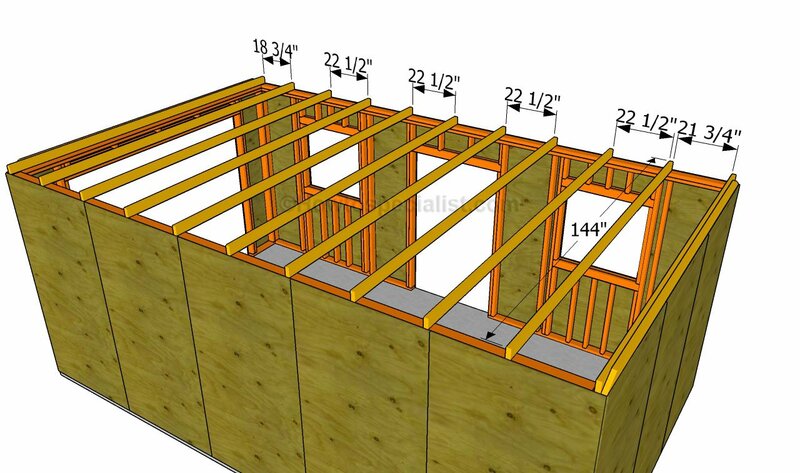 Place the rafters every 24″ on center, if you want to get a professional result. At both ends of the roof you need to double the bottom rafters, as to support the gable ends properly. The next step of the woodworking project is to install the top ridge. 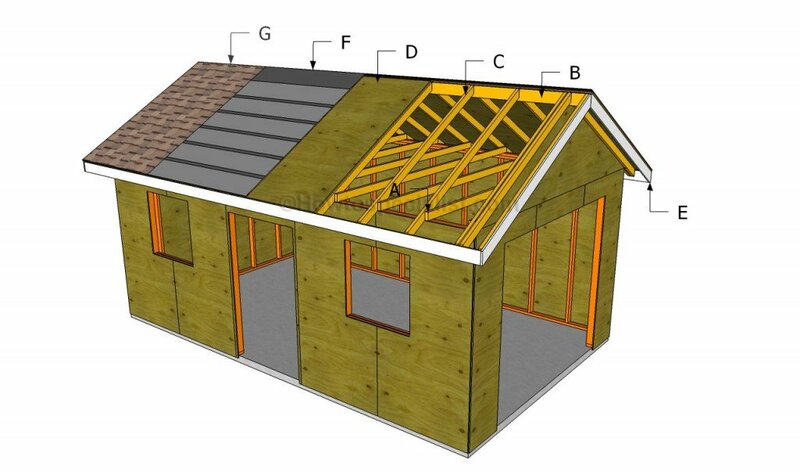 As you can see in the image, you need to secure two 2×4 pieces of lumber at both ends of the roof, in order to support the ridge board properly. Use a spirit level to check if the board is perfectly horizontal. In addition, make sure the supports are plumb. The ridge board should overhand about 10″ both on the front and back of the garage. Continue the project by fitting the rafters into place. As you can notice in the plans, you need to attach the rafters both to the bottom components and to top plates. The rafters bde equally spaced, making sure you leave about 24″ between them. Use the plans from the above image to cut the components at the right size and shape. The intermediate and the bottom components should only be attached to the end trusses, In this manner, you will create a proper support for the gable ends. Use a good saw to make the miter cuts, otherwise you won’t get a professional result. Cut several piece of plywood at the right shape and attach them to the front and back ends of the garage. Use a circular saw with a sharp edge to get accurate cuts. Attach the sheets to the structure and secure them into place with 1 1/4″ nails / screws. If you want to add style to your diy project or if you just want to protect the constructions from water damage, you should consider adding front and back overhangs. As you can see in the image, you need to assemble the overhangs on a level surface, using rafters and small pieces of 2×4 lumber. Lock the components tightly, before attaching them into place. Drill pilot holes and insert 3″ screws into the frame of the roof. The next step is to attack the roof decking. As you can notice in the plans, you should use 3/4″ tongue and groove plywood. These plans are optimized so you don’t have to make a lot of cuts. 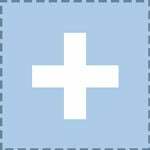 Nevertheless, after adjusting the size of the sheets you should attach them to the rafters and secure them into place with 1 1/4″ screws, every 6″. The plywood sheets should overhang the rafters about 3/4″, as to cover the trims. Build the trims for the garage using 1×6 lumber. Cut the trims at the proper size and shape before attaching them to the ends of the rafters. Use 1 1/4″ finishing nails to lock the components into place. Installing the roofing is not difficult, especially if you have followed the rest of the instructions. Cover the roof of the shed with roofing felt, making sure the strips overlap at least 2″. Secure the tar paper to the plywood sheets with roofing staples. In addition, cut a 12″ piece for the top ridge. Fit the side drip edges over the roofing felt, while the bottom drip edges should be fit under. Smart Tip: Place a starting course at the bottom of the roof, before installing the asphalt shingles. Always read the manufacturing instructions before starting the installation, as there are several aspects that differ. The first course should star with a 3 tab shingle, the second course with a 2 1/2 tab , the third course with a 2 tab, the forth course with a 1 1/2 tab, the fifth course with a 1 tab, the sixth course with a 1/2 tab. Repeat the process from the beginning, starting with the seventh course. Don’t forget that the shingles should overhang from the drip edge about a 1/4″. In addition, secure the asphalt shingles to the roof decking with tacks. Smart Tip: If you want to see how to build the frame of the garage or how to take care of the finishing touches, we strongly recommend you to read the other parts of the article. Thank you for reading our project about how to build a garage roof and we recommend you to check out the rest of the projects. Don’t forget to share our projects with your friends, by using the social media widgets.